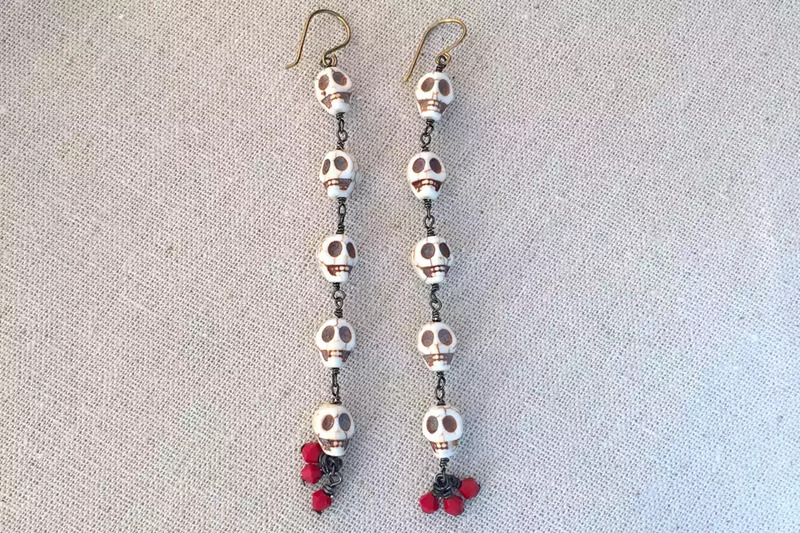 In addition to the beads, you will need a pair of earwires, 22g or 24g craft wire and basic wire working tools including round nose pliers, two pairs of flat nose or chain nose pliers and flush cutters. 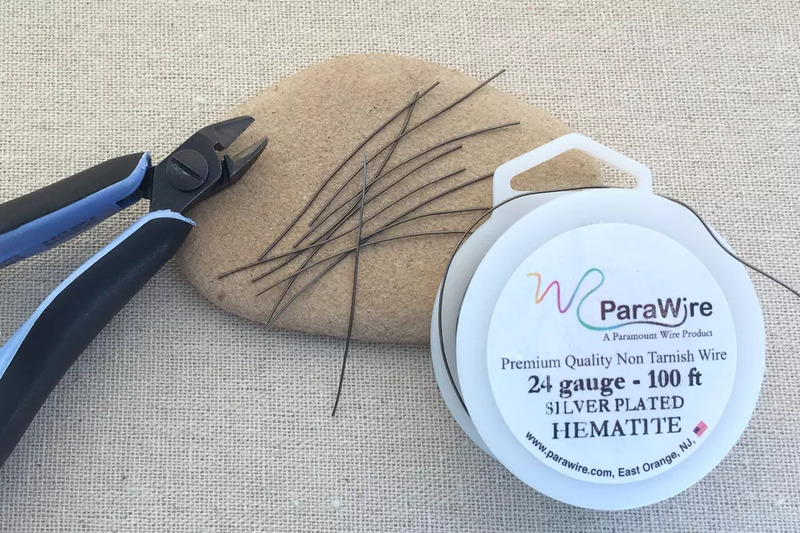 Parawireis a good brand of craft wire that is available in a wide variet of sizes and color finishes. 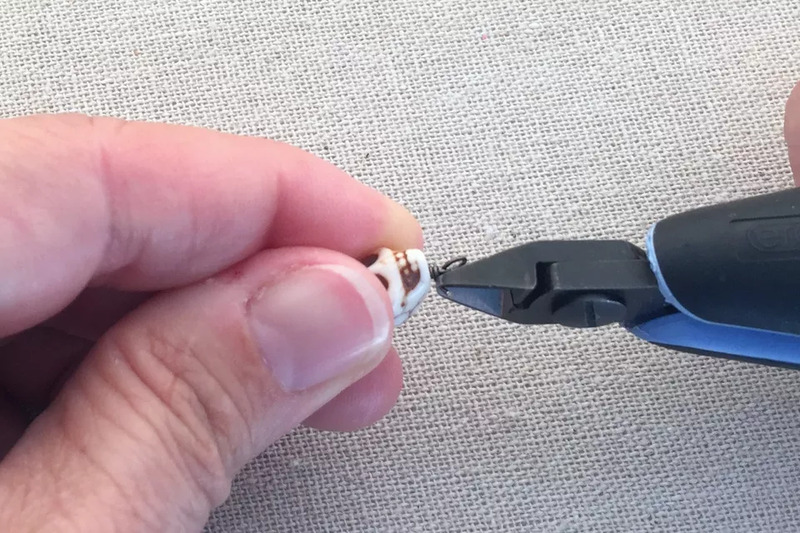 In order to make a wrapped loop, you will need two pairs of pliers – one to hold the loop and another to wrap the tail around the step under the loop. 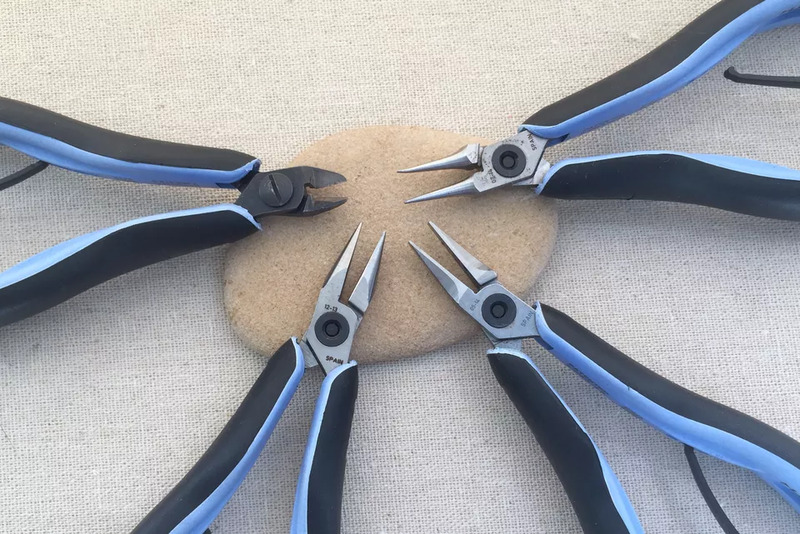 A basic set of wire wrapping pliers will typically have pointy nose pliers, flat nose pliers, flush cutters and round nose pliers similar to those seen in the picture. 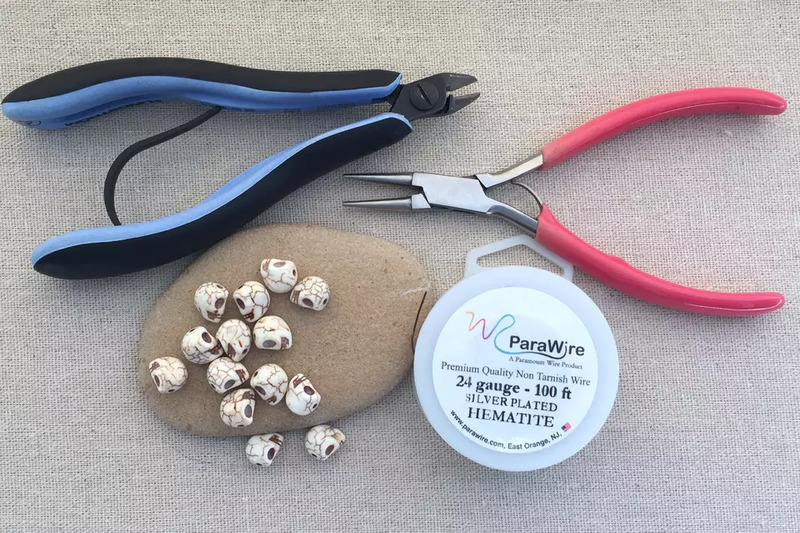 Wire tools are available in all price ranges and you should buy the ones that appropriate for your level of interest, experience and budget. 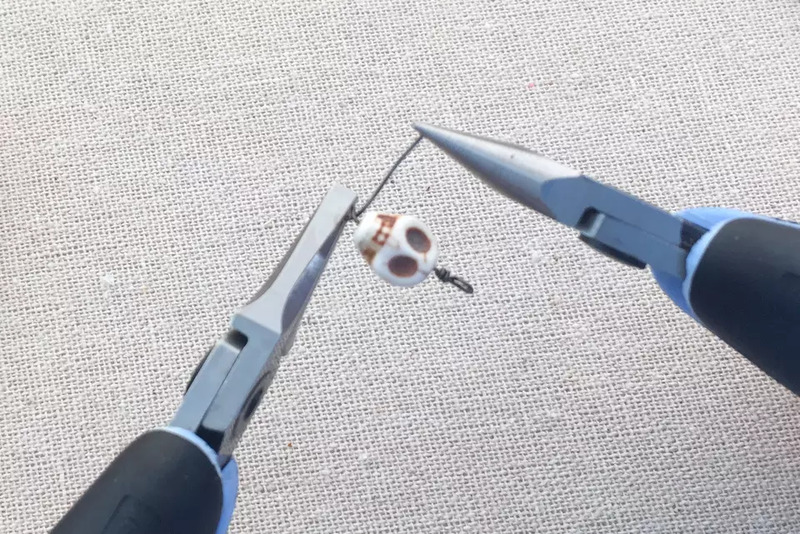 The Lindstrom RX Pliers set shown is one of the more expensive ones, but ergonomically designed to avoid hand strain and are more comfortable to use than craft pliers. The wrapped loop is demonstrated on the second loop, but the process is the same regardless. 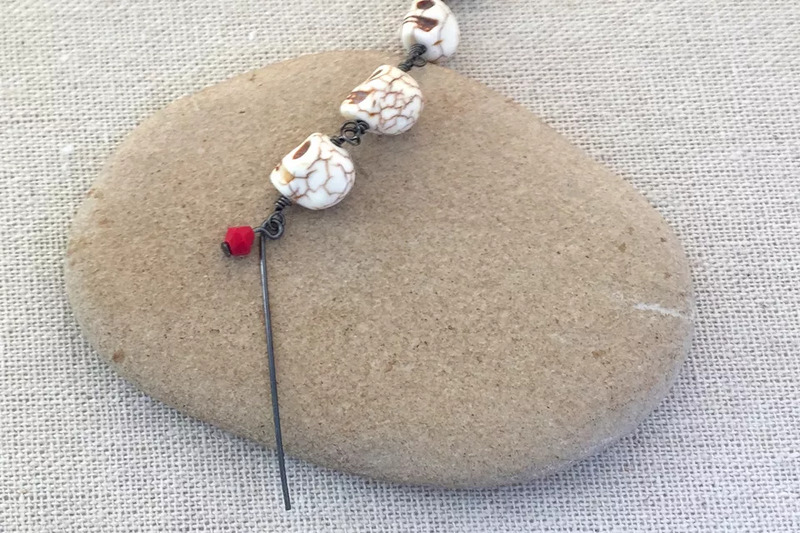 Make a right angle bend in the wire using your round nose pliers – in this case right above the top of the bead. 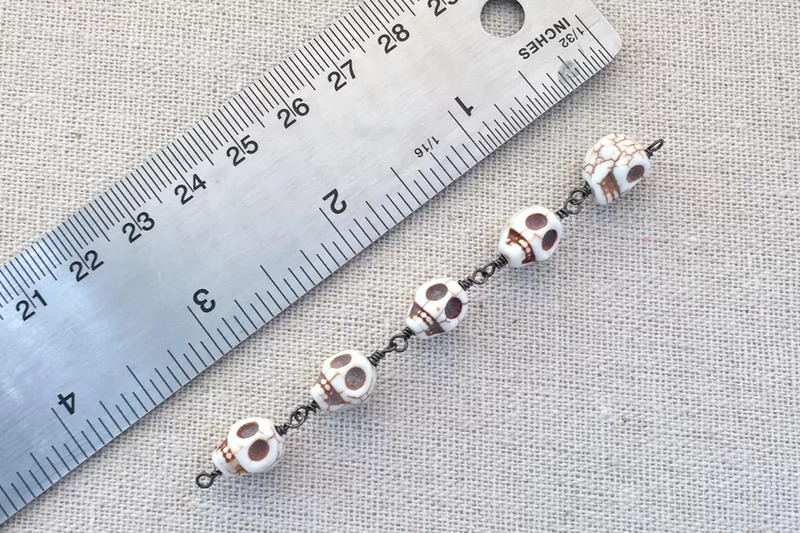 When there is no bead on the wire, you wire make the bend approximately 3/4 inch away from the end of the wire. 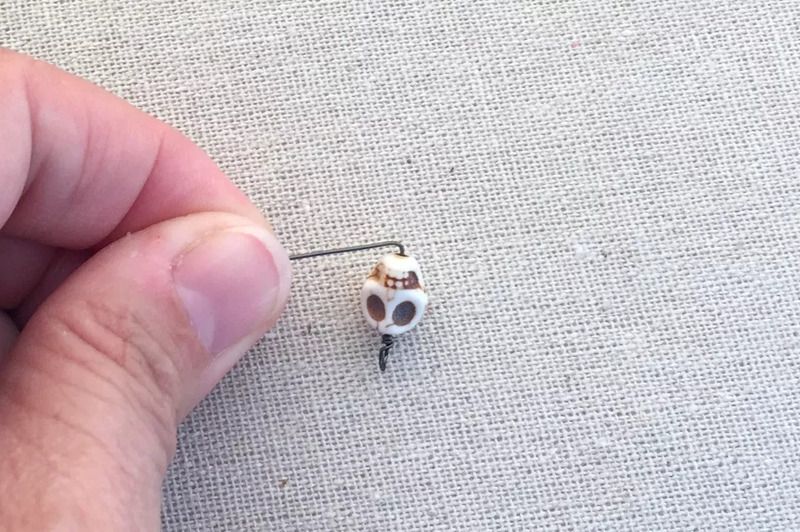 Try to wrap the tail wire tight enough that the bead will no longer spin on the wire. 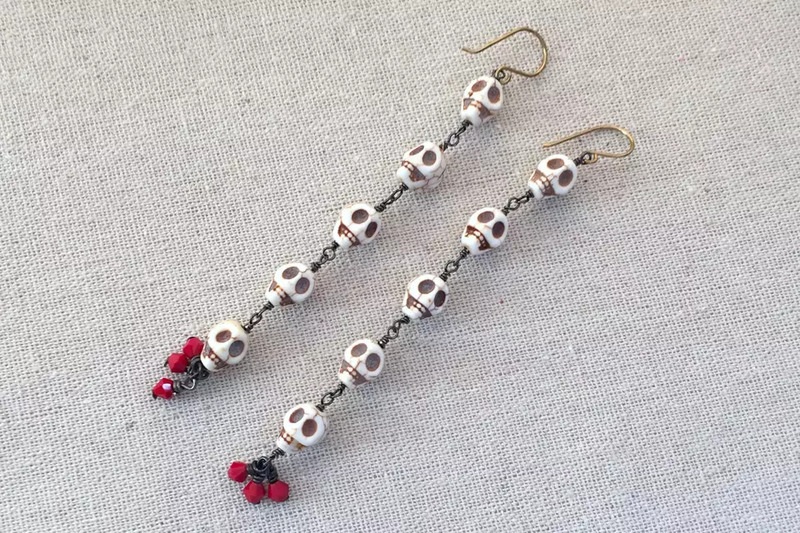 This is a personal preference, but I like to try and have all of my skull beads facing forward and the only way to do that is if they won’t spin freely on the wire. 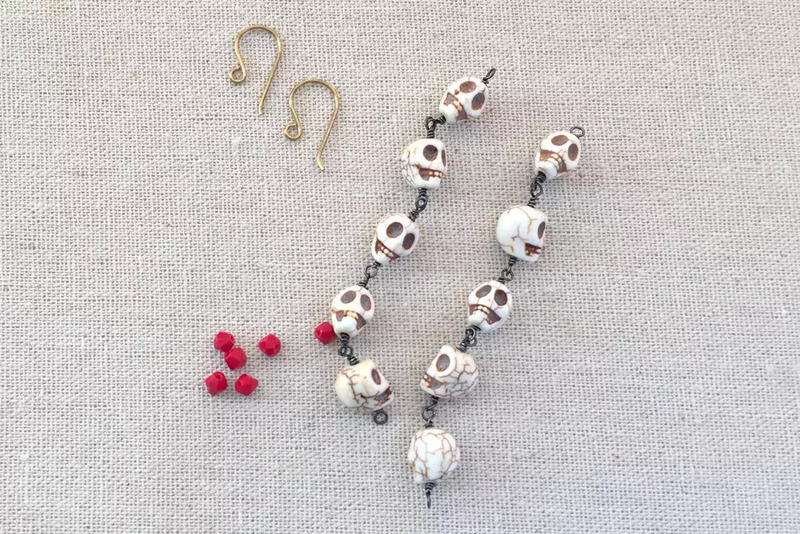 Follow the same process for each skull bead BUT be sure to insert the open loop (before you’ve wrapped the tail) into the closed loop of the prior component in order to link the skull components together. If you forgot, it gets much harder and you may need to cut some loops off and try again. 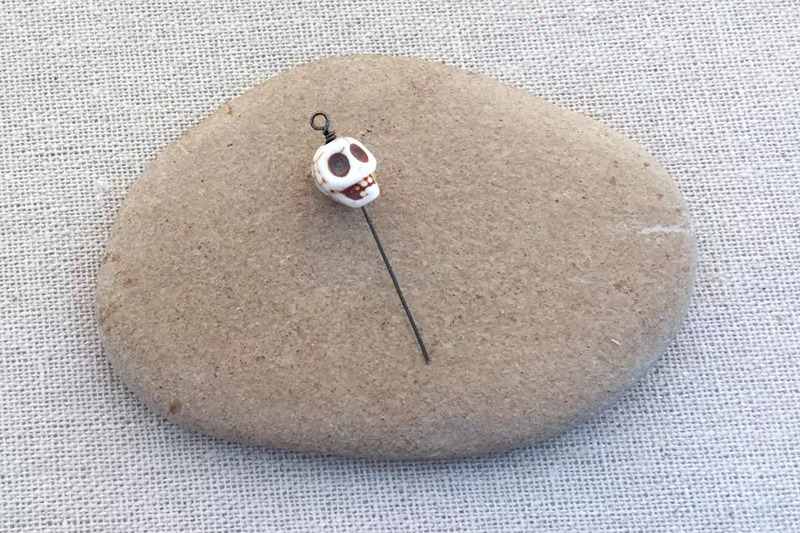 Add a crystal bead to each headpin. Make a loop but don’t wrap it closed yet. 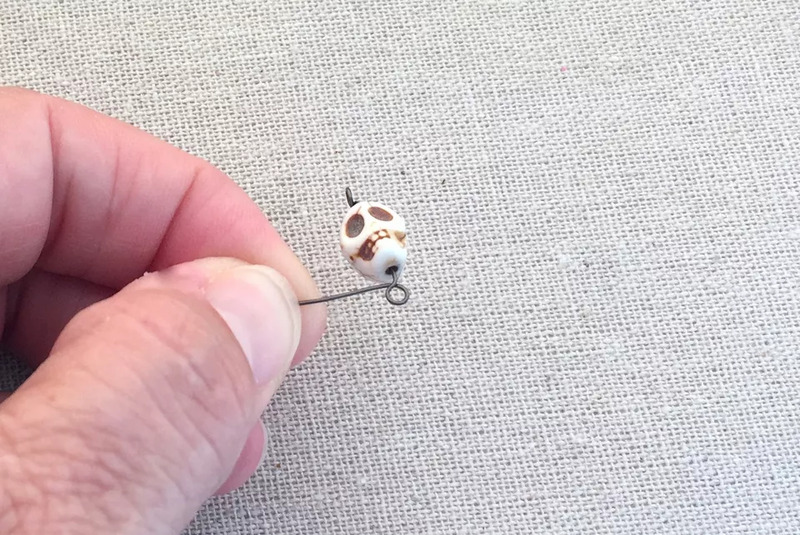 Slip the loop on the loop at the last skull and then wrap the loop closed. 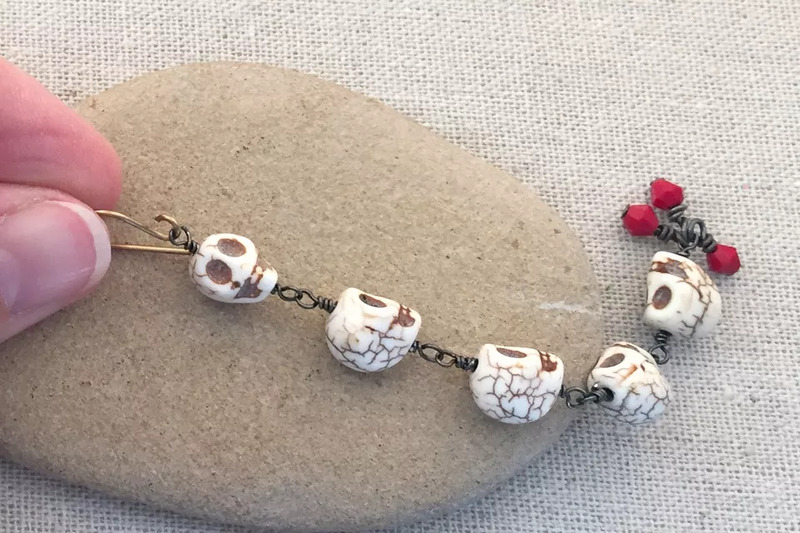 If you have trouble threading all of the dangles on the loop under the skull bead, another alternative is to just wrap the loops closed and then twist open a jump ring, put the dangles on the jump ring and connect it to the bottom of the skull.